Gift of God organized as a preaching station the fall of 1991 as an extension of the ministry of St. Paul, Ponsford, MN and Mt .Olive, Detroit Lakes, MN. As they grew in number up from three families they started meeting in a hotel conference room in Fargo. 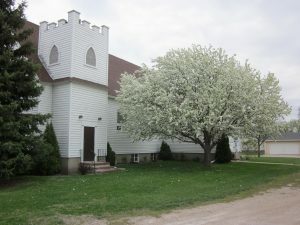 In the fall of 2001 they organized as a congregation and the following year was accepted as a CLC member congregation. 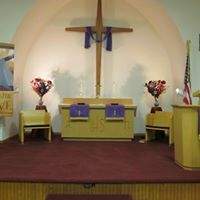 In September 2001, about the same time they organized as a congregation, they moved from the hotel conference room and started renting a vacant church building in Mapleton, ND. Mapleton is a town of approximately 700 people ten miles west of Fargo. September 9, 2001 was the first worship service in the church building which was very memorable as it was two days prior to the September 11 attacks on the United States. The following year, they purchased a church building in Mapleton and on October 13, 2002 the sanctuary was dedicated to the service of the Lord God. The CLC Board of Missions offered mission status to Gift of God in 2005 and Matthew Gurath was installed as the first resident pastor, who served into 2014. Gift of God is still the sole religious organization in the Mapleton community. In 2014, the congregation called Delwyn Maas to be its pastor. He was installed in September of that year and continues to serve there today. 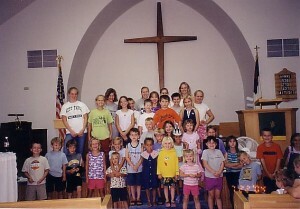 In 2002, CLC members started providing VBS for the Mapleton community with the aid of the Traveling Vacation Bible School team. In the summer of 2007 they felt they were ready to go out on their own, with the help of God, as they did their own flyer distribution and teaching with approximately 20 students in attendance. The TVBS program continues to play a big role in the VBS which is in many ways a form of outreach to the town. To a great extent, the town of Mapleton is a bedroom community with many of its residents working in the Fargo/Moorhead area. In 2016 a building boom began in the community with many new families moving into the area, and that boom is still going strong in 2018. The congregation reaches out to many of those moving in with welcome bags that introduce them to the congregation and invite them to visit. God-willing, Gift of God will become a self-supporting congregation in 2021.